click on the banner below for more details. 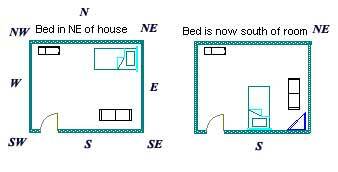 the time dimension of Feng Shui of a given property (home or office). bad ones in places like a bathroom, en-suite, cloakroom or utility room. of the Daily visiting energy. your house. Simply be aware of the potential influences of the sectors. how these may influence your performance. how to do this towards the bottom of this page. area quiet, you successfully manipulate the effect of the energies. to take extra care of your health. you many problem and only here for a month. fan in October is in the north (best), southwest or east part of a room. run a business from home. home or business, this is so important from this month onwards. traditional cure is placing a statue of a red Buddha in the centre. room like a bedroom, office, main door etc. real piece of quartz crystal. 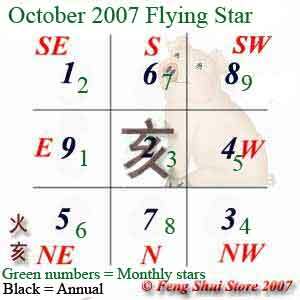 Feng Shui Masters, Practitioners and students throughout the world. to use this palace frequently. for those who are preparing for exams. southwest corner of the bedroom. to remind you of this romantic influence. as previous months. Make hay while the sun shines. a wooden Wu Lou along with a red Dragon headed Tortoise if you have one. lawsuits and emotional and nervous breakdown. in a row with red ribbon to weaken the #2 sickness and bad luck star. anything triangular or square in shape. Moving metal objects such as gongs and bells are very effective remedies. Chinese metal coins tied in a row are also good cures. and be extra careful as to the source of goods bought and their preparation. cure. Just keep the area quiet and keep the door closed. element. You will also need these cures in November as it is even worse. for the month. Place some blue items instead to calm the fiery interaction. you should take extra care with not being overstressed or overworked. unattended and keep matches and lighters out of children’s reach. to weaken this area in October. the north – southeast axis may be more prone to illnesses this month. and adults are dressed appropriately according to the weather. to weaken the #5 sickness and bad luck star. desk or use blue or wavy pattern beddings on your bed. placed at any time of the year. on the banner below for more details. bed or work/study tables are in a more beneficial area for the month. influence and so it will pass. and agree to give us credit for our hard work and a link back to our website.